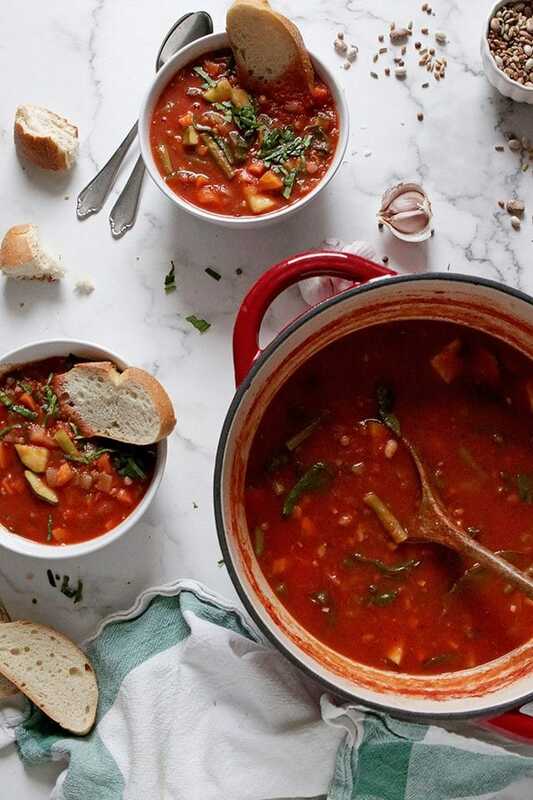 This hearty vegan minestrone soup is packed with seasonal vegetables, beans, lentils and whole grains. Perfect comforting vegan winter soup full of flavor and nutrients! 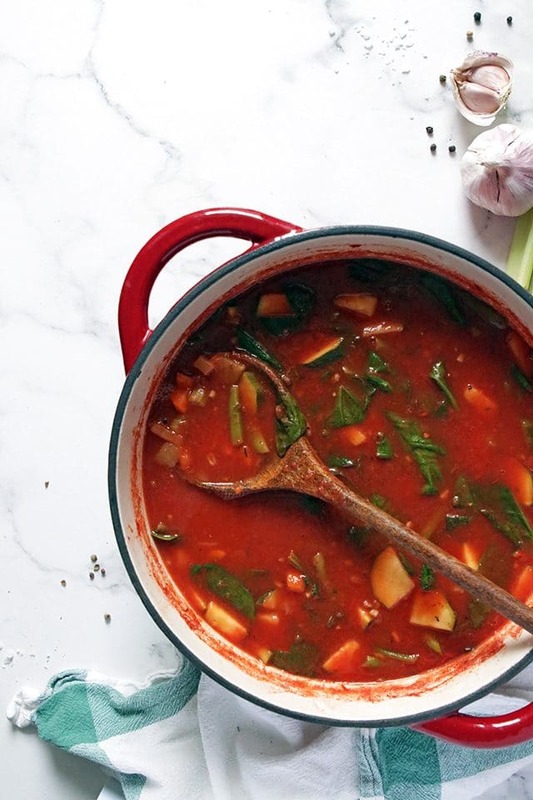 This winter vegan Minestrone soup is a great example of how to combine vegetables, proteins and carbs in a single bowl. It has lots of veggies, it has plant-based proteins and it has whole grains. 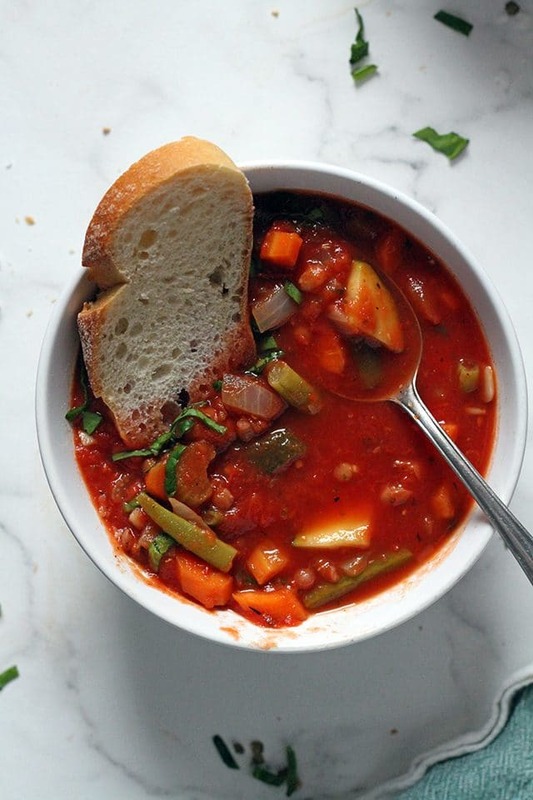 This minestrone soup is very nutritious and wholesome while being so delicious and comforting! 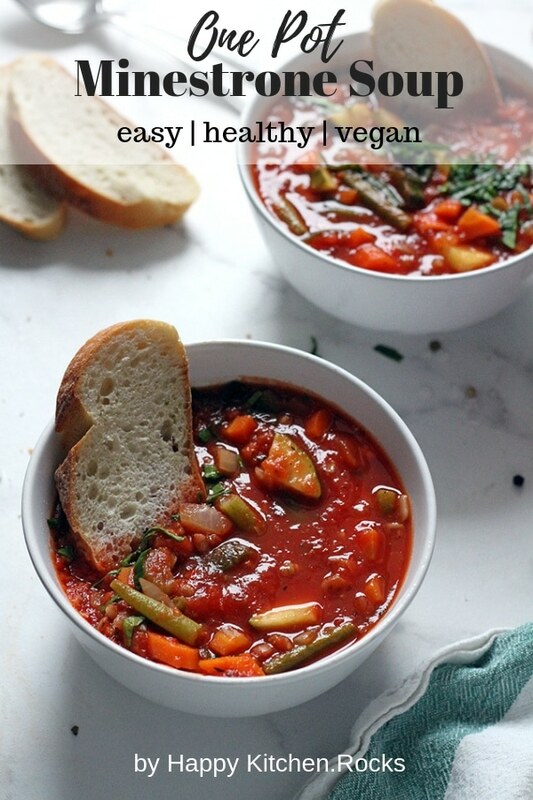 You can make this vegan minestrone soup in one pot within 30 minutes, that makes it a perfect quick weeknight dinner, portable lunch and freezable meal prep recipe! The recipe I’m sharing with you today is super easy and also budget-friendly as it uses basic pantry items you probably already have like beans, canned tomatoes, onions and basic spices. 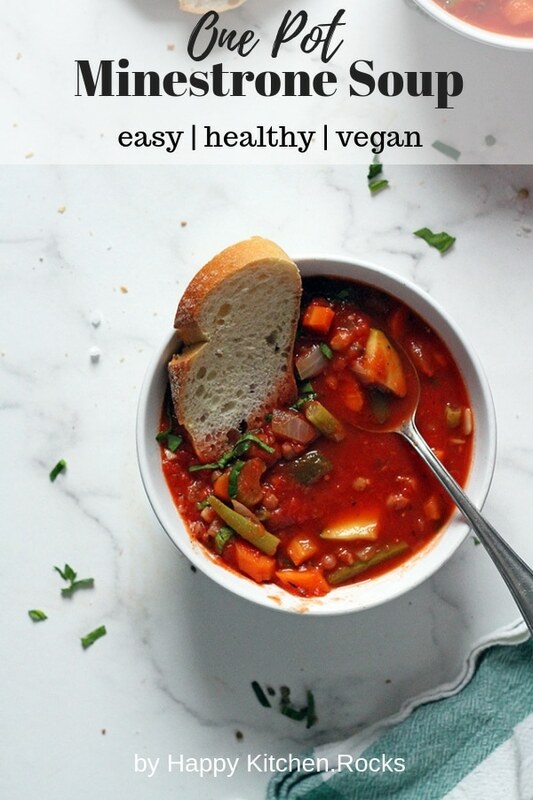 Just like my favorite slow cooker vegan chili, this vegan minestrone soup can be made in a slow cooker as well. 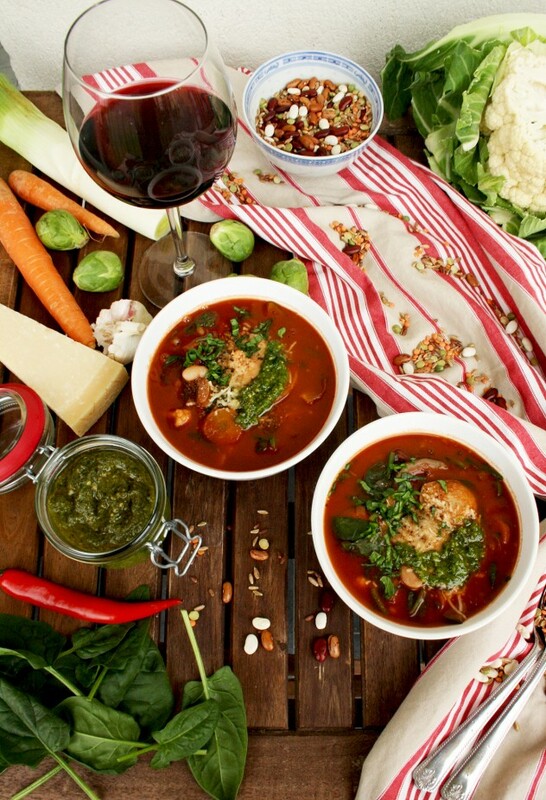 There is no set recipe for minestrone soup but the word “minestrone” means “thick vegetable soup” in Italian. The idea is to use leftover or seasonal vegetables with an addition of beans and lentils, sometimes also pasta and rice. 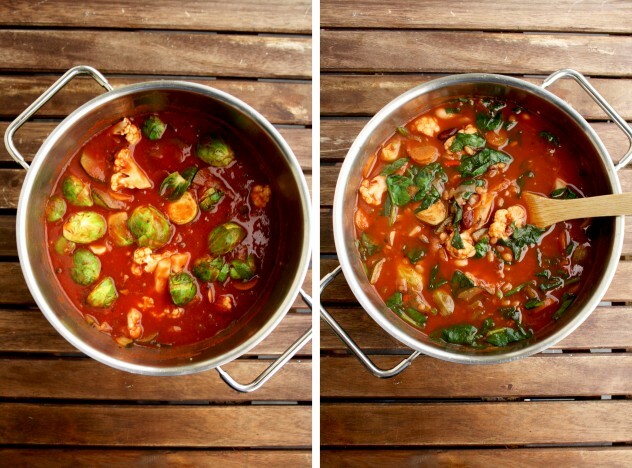 Since minestrone originates from ancient Rome, there were quite a few changes of the “recipe” along the way, like the addition of tomatoes that came from America. Anyway, minestrone is considered rustic and humble food just like shepherd’s pie or ratatouille. 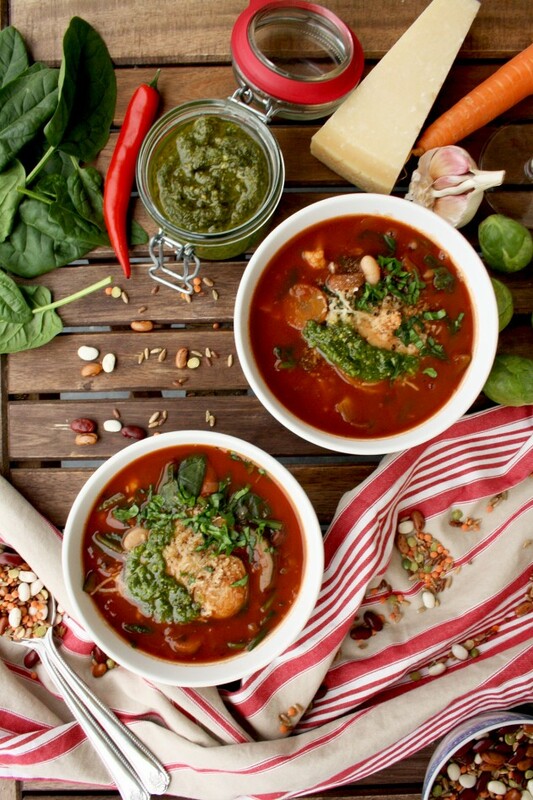 The best thing about minestrone soup is that it was traditionally made from leftover vegetables, so you can use whatever veggies you like or have on hand, as well as any kind of beans and whole grains to put in the soup. I used all the fresh and seasonal veggies I had in the fridge like carrots, celery, zucchini, green beans and spinach. Alternatively, you can use kale, chard, potatoes, butternut squash, winter squash, peas, turnips, cauliflower, broccoli, bell peppers, asparagus, sweet potatoes, fennel, cabbage in any combination. You can’t get it wrong if you use any seasonal veggies. 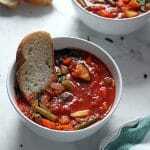 For this vegan minestrone soup, I added protein from various beans and lentils. I used a mixture of red kidney beans, cannellini beans, pinto beans, dried peas and red lentils. Feel free to use your favorite kind of beans and/or lentils. Chickpeas, navy beans, fava beans or black beans would work perfectly well. There are no rules here! You can skip lentils and add more beans or vice versa. Traditionally, small pasta like orzo, anelli or small shells is added to minestrone but to make it more nutrient-dense I added whole grains. I used a mixture of wheat berries, rye, spelt and millet that I usually use for my healthy wholemeal bread. 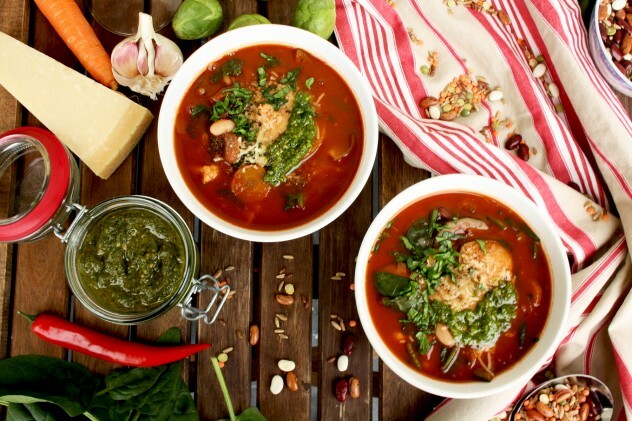 You can use any kind of whole grains or cooked whole grain pasta for your vegan minestrone soup. 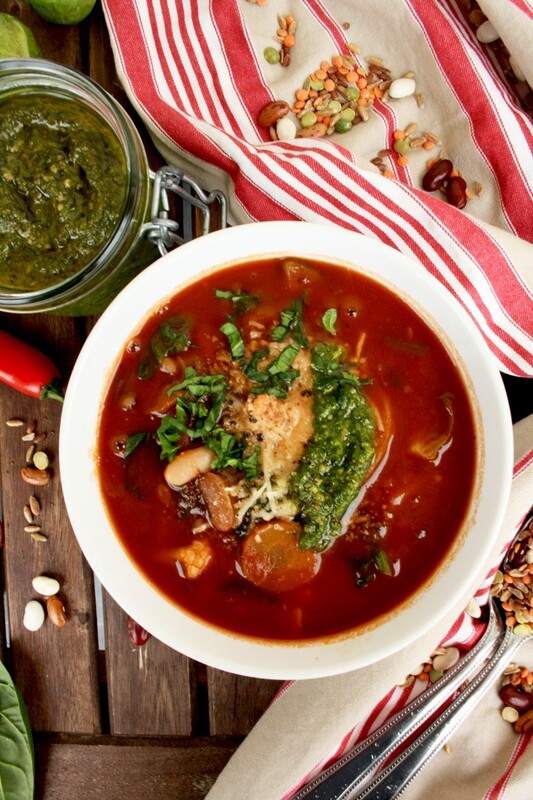 This vegan minestrone is loaded with fiber and plant-based proteins. It makes for a satisfying and nutrient-dense meal that you can customize in any way you want. It is low in calories and fat and high in nutrients, thanks to a variety of veggies, beans, lentils and whole grain used in the recipe. It makes for a perfectly balanced meal that provides all essential nutrients, vitamins, minerals and antioxidants. 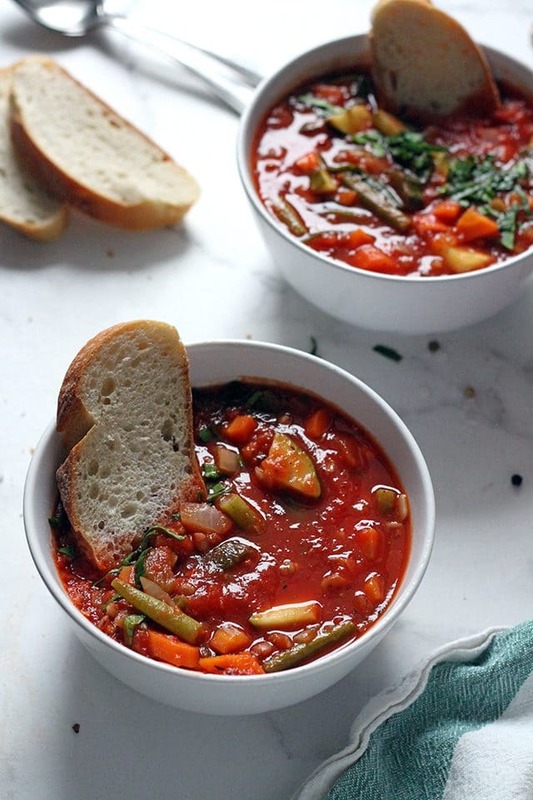 Vegan minestrone soup is just as healthy as it is delicious! I mixed the grains and dried beans and soaked them over night, then boiled for 30 minutes. You can do the same or use canned beans to cut off the cooking time. 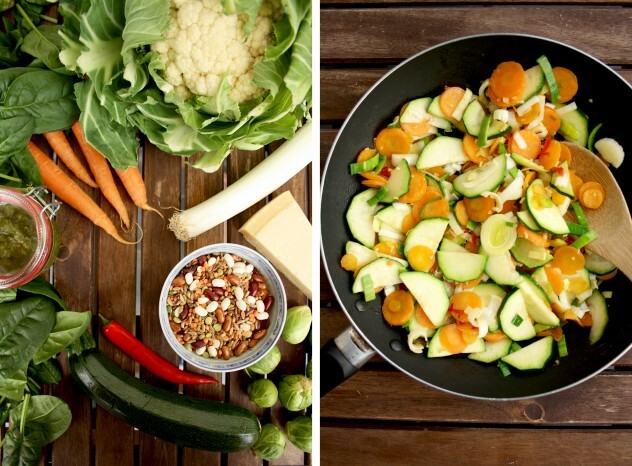 The second step is to chop and sautée your veggies. Then add your liquids: I used a mixture of vegetable and bean broth as a base together with canned tomatoes. 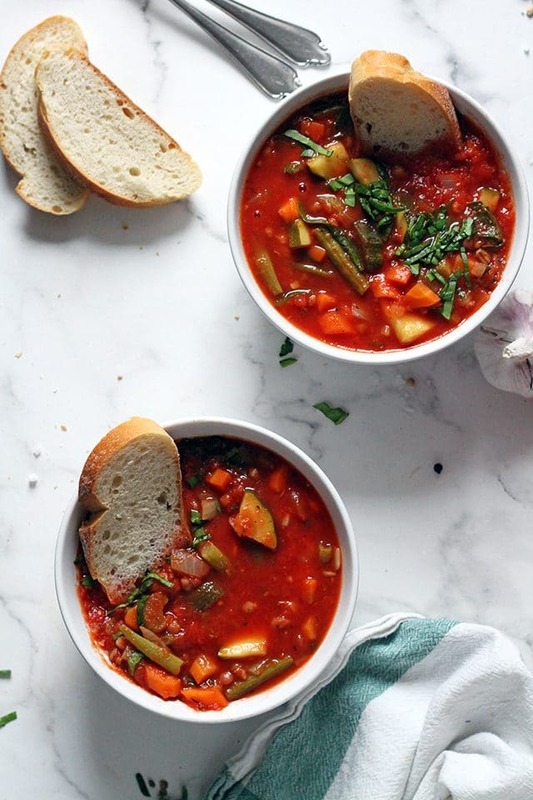 Enjoy this vegan minestrone soup with crusty ciabatta bread or vegan pesto to add a nice fresh touch. The soup came out thick and wholesome, just perfect for the chilly winter nights. If you are craving something ultimately comforting and flavorful, this vegan minestrone will make you feel good. Check the recipe (and the video recipe!) 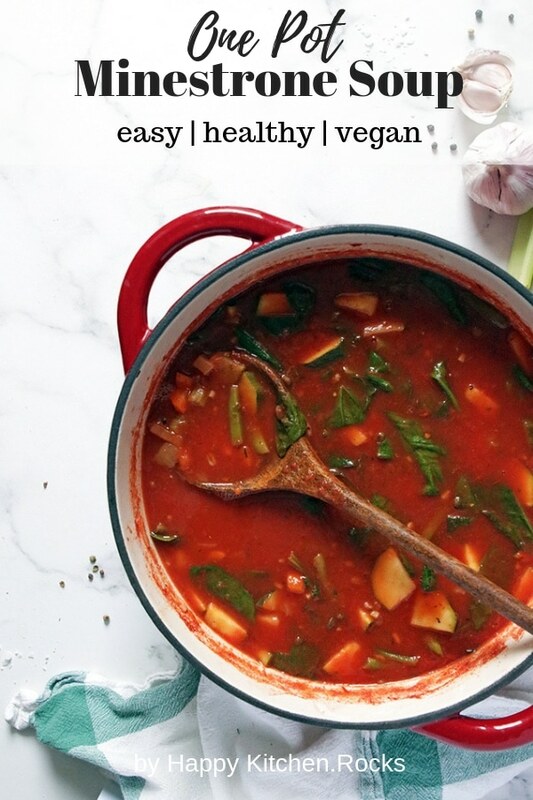 for this vegan minestrone soup below. If you can’t see the video, disable your AdBlock for this page by clicking on the AdBlock button and selecting Don’t run on this page. Enjoy! BEANS: Drain soaked beans and grains, transfer them to a pot with 3 times more water and cook over medium heat for 30 minutes. Alternatively, use canned beans (see notes below). SOFFRITO: Meanwhile, heat olive oil in a large Dutch oven or skillet. Add onions, carrots and celery and sautée for about 5 minutes over medium-high heat. Add green beans, zucchini and garlic. Cook for 5 more minutes, stirring occasionally. SOUP: Add basil, thyme, oregano, chili flakes, black pepper, sea salt and bay leaves. Add crushed tomatoes, vegetable stock, beans and grains together with the cooking liquid. Bring to a boil and stir in spinach. Simmer for 10 minutes with a lid on. GARNISH: Garnish with chopped parsley and serve with ciabatta bread and vegan pesto (optional). Enjoy! The conversion rate between dried and canned beans is roughly 1 to 3. If you are using canned beans, multiply the amount of dried beans stated by 3 to get the right amount of canned beans. 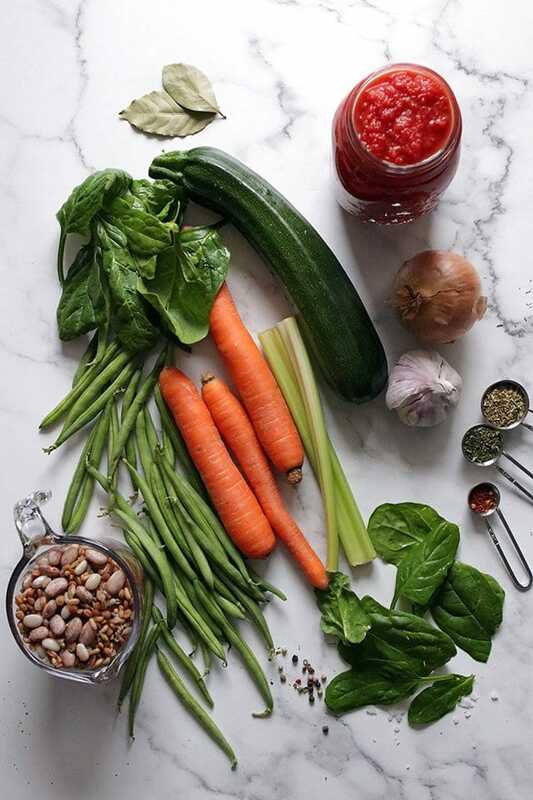 What is your favorite veggie soup? Leave a comment below!